In week 3 we explore the element of Texture after having studied shape and line earlier in the term. 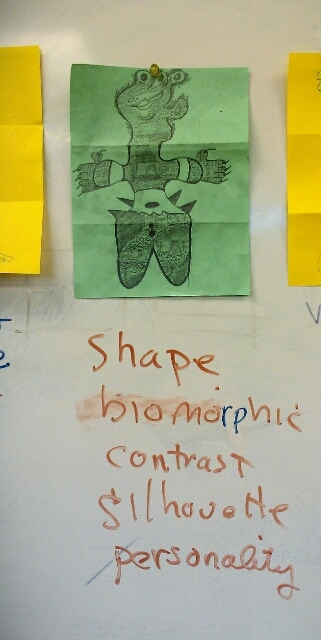 Objective: The exquisite corpse project integrates shape and line with the new topic, texture. Groups of three students create an exquisite corpse creature by passing around a tri-folded paper and drawing a head on the top section, a body in the middle, and legs or fins on the bottom. Then they unfold the creature and laugh. Next step is to go out into the school and do rubbings to transfer tactile texture from the environment into visual texture on the monster. We display the texturized creatures next to each other on the whiteboard with magnets. We look at the design vocabulary list and determine what design qualities are illustrated by each monster. This one had a variety of textures and strong contrasts. Students enjoy this activity because it is a shared creativity that relaxes students who think they can't draw. All the drawings look weird and all exhibit the needed element of texture. This activity also connects to art history and teachers may want to show historical exquisite corpses and discuss the surrealists.